Question: Why does a hippopotamus lick a crocodile? Some of you may recognise this as a variation on the joke about a dog and why he licks his... okay, I'll let you fill in the rest. When I mindlessly surf around the Net late at night, overtired and a little zoned out, I sometimes run across the darnedest things that I may never have otherwise seen. National Geographic has a video floating around in cyberspace on YouTube and elsewhere that shows hippos licking crocs. Yep, you heard me correctly and before I say anything else about it, you just need to look at this most unusual of animal behaviours. Okay, I suppose like a lot of people, I could have stopped there and moved onto the next oddball video during a marathon of late night surfing, but I thought to make note of this and come back to it with the intention of discovering what could explain such behaviour. After all, a crocodile is a fairly menacing predator and it's a little hard to fathom why they just lay there and "take it". At any moment during the clip, I was expecting the croc to whip around and snap at the hippo, but no, he just didn't pay any mind to this intrusion at all. A little digging rewarded me with an article entitled "The Hippo Whisperer" on the official web site of the BBC Wildlife Magazine. The author, Karen Paolillo, is a researcher who has spent some time studying the hippopotamus up close and personal, that is in the wild in their nature habitat. She has some revealing insights about this oddity of the animal kingdom. It is the third-largest land mammal by weight (between 1½ and 3 tonnes), behind the white rhinoceros (1½ to 3½ tonnes) and the three species of elephant (3 to 9 tonnes). Despite its stocky shape and short legs, it can easily outrun a human. Hippos have been clocked at 30 km/h (19 mph) over short distances. The hippopotamus is one of the most aggressive creatures in the world and is often regarded as one of the most dangerous animals in Africa. Ms. Paolillo concurs with the aggressive nature of the animal and considering how close she's gotten to them in her studies, she should know. While these animals are herbivores which one usually associates with a more passive temperament, they are apparently very territorial and display an unusual aggressiveness in their waters. In an odd contrast, hippos are known to come onto land during the night to graze on grass but they are not territorial on land, only in the water. Why do hippos lick? According to Karen Paolillo and other experts, this plays a part in their grooming and is performed mainly around the rear of other hippos. It is thought that the scent of dung stimulates this activity. Hippos are known to flip their tails when defecating seemingly with the express purposes of spreading the fun around and considering that hippos and crocs are many times side by side one another on a river bank, it is thought that some of that dung ends up on the crocs. In the video, when we see the hippo licking the croc, the conjecture is that the hippo is motivated by dung on the croc. Of course what is truly noteworthy in this interaction between the hippopotamus and the crocodile is the acceptance on the part of the reptile. The hippo is big, strong and armed with a sizeable set of teeth which can do untold damage to the recipient of a bite. Obviously the crocodile knows who the boss is and knows the futility of protesting. Another unusual behaviour on the part of the hippopotamus is that it will sometimes intervene on the behalf of other animals. This was observed firsthand by Ms. Paolillo. The following video demonstrates this charitable attitude to those who are smaller and weaker and it is difficult not to attribute to the animal the human characteristic of kindness. What is the actual motivation of the hippo? A crocodile grabs hold of a young impala crossing a stream but a hippo steps in and scares the croc into letting go. The hippo then helps the impala out of harm's way and attempts to revive it. Unfortunately it's too late, the impala succumbs to its injuries but it is amazing to see the hippo try to do this. 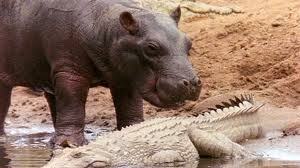 This next video demonstrates the same behaviour on the part of the hippo: he takes a carcass away from a crocodile. However, while the viewers in the clip keep saying that the hippo is munching on the body, it strikes me when comparing this to the previous video that the hippo may be trying to revive the dead animal. Wikipedia mentions that hippos have been known to eat meat but this to be rare as its stomach anatomy is apparently not suited to carnivory. YouTube video: Hippo vs Large Male Crocodile. Hippo takes carcass away from a crocodile. Hey! So, a hippo licking a croc. Ha! Is that up there on the weirdness scale? And when you read the title of this article you said to yourself, "What a crock!"